Select a handbag coming or going via this Betsy Johnson Telephone Purse T-Stand Display. And since a T-Stand has two arms, you have two distinct purse choices, one from each end. I review the stand, but you should consider the extra purse functionality. Pug your cellphone into the purse, drop it inside, and you can answer via the purse retro handset outside. Consider purse display in the gallery of images. 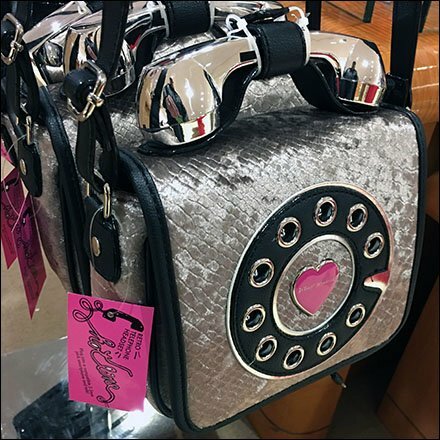 This Betsy Johnson Telephone Purse T-Stand Display courtesy of Macy’s.